Aquí se fundó el Colegio Montejo “Anexo”, el 2 de septiembre de 1941, donde también funcionó el primer centro colectivo de alfabetización para adultos, a iniciativa del Mtro. Dr. Jose E. Santana Robles, con la colaboración y patrocinio del Sr. D. Joaquin Peon Aznar. 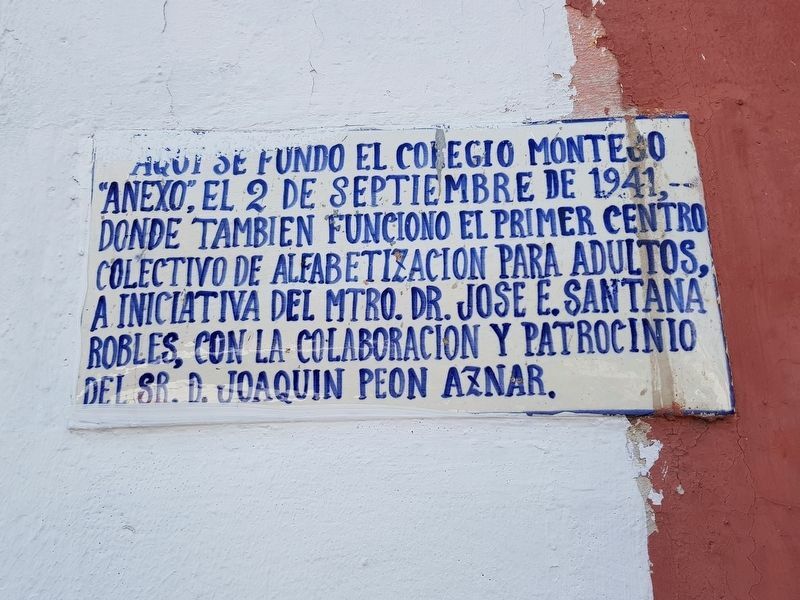 Here was founded the Colegio Montejo "Annex", on September 2, 1941, where the first collective adult literacy center also operated, at the initiative of Dr. José E. Santana Robles, with the collaboration and sponsorship of Joaquín Peón Aznar. Location. 20° 57.729′ N, 89° 37.535′ W. Marker is in Mérida, Yucatán, in Municipality of Mérida. Marker is on Calle 69A just west of Calle 62, on the left when traveling west. Touch for map. Marker is in this post office area: Mérida, Yucatán 97000, Mexico. Touch for directions. The marker is roughly in the center of this view, attached to the right side of a barber shop. 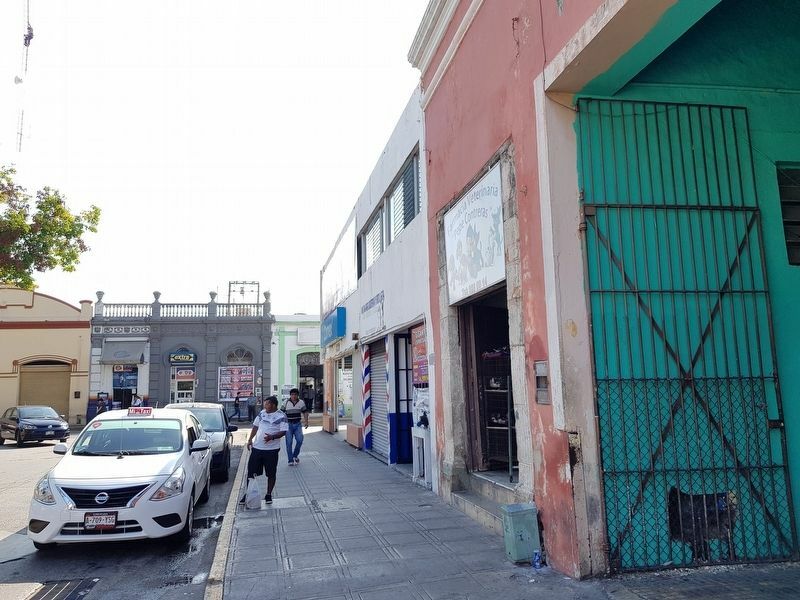 direct line); Corner of Calle 62 and 67 (about 180 meters away); Monsignor Norberto Domínguez (about 210 meters away); The House of the Headless Friar (about 240 meters away); Calle 64 (approx. 0.2 kilometers away); Consuelo Zavala C. (approx. 0.3 kilometers away). Touch for a list and map of all markers in Mérida. More. Search the internet for Colegio Montejo Annex. Credits. This page was last revised on March 15, 2019. This page originally submitted on March 15, 2019, by J. Makali Bruton of Querétaro, Mexico. This page has been viewed 34 times since then. Photos: 1, 2. submitted on March 15, 2019, by J. Makali Bruton of Querétaro, Mexico.